Drexel University Television Management student from Italy lives out her dreams of working in American Television at the network level. “Drexel’s Television Management Graduate Program has opened networking doors for me that will never close,"
When Alessia Porcari was a child growing up in Rome, Italy, she dreamed of one day working in American Television. Always supportive, her parents and grandmother stood by her side, fostering a sense that this little girl with big dreams could accomplish anything she set her sights on. 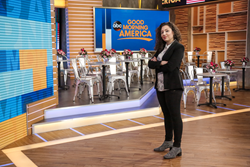 Today, at age 25, while talking on the phone to her beloved “Nonna”, Alessia spouts out the details about her experiences on the set of ABC’s Good Morning America in New York. From meeting the artist behind the song that got her through some tough times as a teenager, Jessie J., to writing the very Italian segment titled, “Pay It Forward Gelato”, this young lady is not only living out her dreams – she’s proving her parents and Nonna right. Through hard work, a clear focus and a solid education, Alessia Porcari is paving her own way in the American Television Industry. Porcari’s professors at Drexel are quick to shift the credit to Porcari. “She’s one of the hardest working students to walk down these halls,” said Professor Al Tedesco, who leads the Television Management Graduate Program. “While our faculty and staff have created an environment of networking and opportunity, Alessia took that ball and ran. Her success is a combination of the skills she learned in the Television Management Program and her own tenacity and attention to detail,” he added. The Good Morning America team has noticed that attention to detail and hard work. Porcari is not just an intern. She’s proven herself as a segment producer, videographer, still photographer, and all-around team player. “I find, pitch and write entertainment and public interest stories as well as come up with celebrity interview ideas,” said Porcari. But it doesn’t stop there. The young television all-star assists in segment production, leading in-depth background research on guests and topics, and discovering and booking audience members for live, in-studio and remote segments. She also works with ABC’s digital team, taking photos throughout the show, during interviews and live performances. ABC shares those photographs on the network’s various social media platforms, which have more than one million followers each. For more information about the Paul F. Harron Graduate Program at Drexel University, visit http://drexel.edu/westphal/academics/graduate/TVMN/ or contact Al Tedesco, Program Director, at ast33@drexel.edu.